Coach Ted Williamson and the Munster Reds selectors have announced their side for the Reds’ second Hanley Energy Interprovincial T20 game of 2018 against the North-West Warriors at Eglinton CC this Friday. Having put themselves in an excellent position after the first innings, the Reds just couldn’t turn the screw against an experienced Lightning side in their refixed game at Pembroke CC last Friday. This time they face the long trip to the opposite side of the island, but with plenty of spring in their step, trying to cause a shock away from home against a Warriors outfit who won their opening game against the Knights. Three changes from the squad that were defeated by Leinster Lightning last Friday, with Ruadhán Jones and Jack Carty stepping out, while Nicolaas Pretorius and David Delany return to the fold from last year. Meanwhile young spinner Diarmuid Carey replaces Morne Bauer, unavailable due to work commitments. Limerick’s Murtaza Sidiqi retains his place in the side, after a fearless cameo with the bat that included a couple of boundaries, including a big six over long-on. 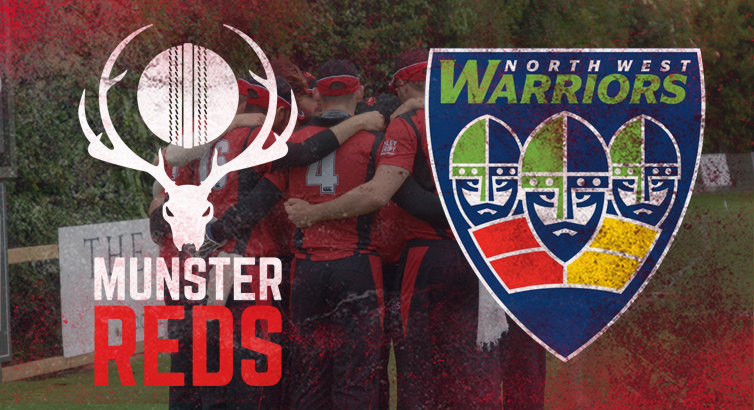 North-West Warriors v Munster Reds, Eglinton CC, Friday 25th May, 5pm. Jack Tector (YMCA, Captain), Yaqoob Ali (Co Kerry), Tom Anders (Phoenix), Diarmuid Carey (Cork County), Jeremy Benton (Cork County), Nicolaas Pretorius (The Hills), Robert Forrest (Clontarf), Stephen Doheny (Rush), Jamie Grassi (North County), David Delany (Clontarf), Max Sorensen (The Hills), Murtaza Sidiqi (Limerick).